To be considered for admission as a candidate for the MPA, MPP or MA in ENRP degree, you must have a bachelor's degree awarded by a regionally accredited U.S. college or university or equivalent degree from a recognized non-U.S. institution. As of fall 2016, the Trachtenberg School does not require applicants to submit Graduate Record Examination (GRE) scores, although scores from exams taken within the past five years can be sent directly to the university (code 5246) if you would like them to be considered. The admissions process is competitive and, normally, a minimum of a B average in undergraduate coursework is required for admission to graduate study in the Columbian College of Arts and Sciences and successful applicants typically have GPAs of 3.5 or higher. However, we take into account all aspects of your application and consider a wide range of factors that indicate your ability to succeed in the curriculum. These also include, but are not limited to, your undergraduate major, undergraduate institution, graduate coursework (if applicable), GRE scores (if submitted), relevant work experience, personal achievements, strength of recommendation letters, and commitment to public service. 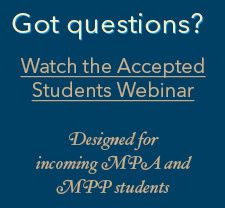 When considering MPA applicants, we also look for interest in public administration, management, and/or leadership which may be evidenced through courses, work, or volunteer experience. When considering MPP applicants, we look for evidence of interest in public policy and for evidence that you will succeed throughout the curriculum, including in the program’s quantitative courses in economics and statistics. Such evidence may come from success in quantitative undergraduate courses or from quantitative scores on the GRE (if provided). Learn more about the ENRP requirements. Please note: The GRE is no longer required for admission to the masters programs in the Trachtenberg School. Applications for Summer or Fall entry are due on January 15 for those seeking fellowships, and February 1 otherwise. Applications for Certificate programs are due November 1 for spring entry and July 1 for fall entry.